What is an Affidavit of Heirship? A Wyoming Affidavit of Heirship is used to establish ownership of a Decedent’s property when the Decedent failed to execute a will or failed to divide all of his or her property through his or her Last Will and Testament. When someone in Wyoming dies without a will, legal issues usually arise as to who has title over the property. The purpose of an Heirship Affidavit is to find the identity of the rightful heirs of the person who passed away and determine the amount of their respective share of the property. Fill out and print a free Affidavit of Heirship form in minutes online. This type of property is referred to as Heirship property. First, an heir cannot sell Heirship property. Second, title companies will not issue title insurance until Heirship issues have been addressed and resolved by all the heirs involved. This must be done by either a probate proceeding in county court or by an Affidavit of Heirship for the State of Wyoming followed by a deed signed by the heirs of the person who passed away. Instead of going through the probate process to have title to the property transferred to the Decedent’s heirs, the heirs have the opportunity to file a Wyoming Affidavit of Heirship form in the deed records of the county in which the real estate owned by the Decedent exists. They personally knew the Decedent. The Decedent died on a certain date in a certain county of Wyoming. They are aware of the identity of the Decedent’s family members and heirs. A statement that the Decedent did not owe any debts at the time of his or her death. A statement that the witnesses do not stand to gain financially from the Decedent’s estate. Once the Affidavit of Heirship has been signed and recorded in the deed records of the County in Wyoming, it attaches the Decedent’s real estate to his heirs. It is at this time that the title companies and real estate companies will allow the heirs to sell the property. However, if a person dies intestate, the State of Wyoming will make a will for the person. The purpose of a Wyoming Affidavit of Heirship in an intestacy case is to describe family history and state exactly to the court who the heirs are. Where do I File a Wyoming Affidavit of Heirship? The Wyoming Heirship Affidavit must be signed under oath by a person familiar with these facts. The document is then filed in the real property records of the county where the property is located. For real property, the Wyoming Affidavit of Heirship may be filed with the deed records office of the county in which the property lies. Multiple properties can be covered under the same Heirship Affidavit so long as they are located in the same county. For personal property, the Heirship Affidavit should be presented to any individual or business that has authority to release the property. 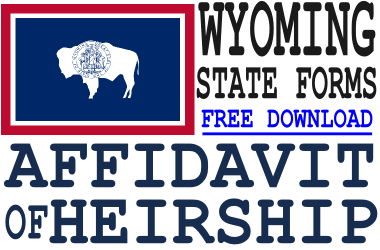 Why do I Need a Wyoming Affidavit of Heirship? The Wyoming Affidavit of Heirship is often used to release funds in banking, savings and investment accounts owned by the Decedent at his or her time of death. A Wyoming Affidavit of Heirship gives absolute evidence of the family history of the Decedent and his or her heirs, so legal means can be applied to the facts concluding the legal inheritance of the property. Title companies accept a Wyoming Affidavit of Heirship during the transfer of real estate. 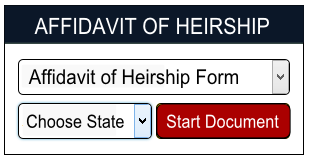 Click here to start a free Affidavit of Heirship form online.